Dunkin’ may have dropped the donuts from its name, but the company continues to deliver -- if not overdeliver -- in the sugary fried dough department. 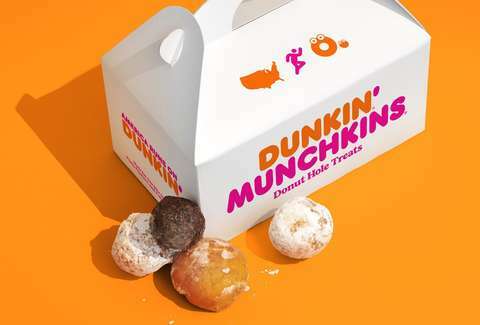 Now, the chain has announced some exciting news that could shake up your breakfast routine: Munchkins just got cheaper. In addition to a series of new donuts for Valentine’s Day, Dunkin’ is offering 10 munchkins for $2, according to a report from Brand Eating. So whether you’re a fan of glazed, glazed chocolate, blueberry glazed, jelly, powdered sugar, cinnamon or enjoy a variety, you can tuck into a box of munchkins for less than the cost of well… most other breakfast options. Typically, a 25-box of munchkins costs $5.99, so this is a pretty good deal. If you’re more a full-sized donut kind of person, Dunkin’ has plenty to offer you this month. You can pop into your local store and get your favorite donut in heart shapes or frosted with pink and white frosting and Valentine’s Day sprinkles. Dunkin’ also introduced its first ever two-filling donut, which combines cookie dough and brownie batter inside fried dough topped with a crumbly pie topping. They all come with an instant sugar coma, too. But the Valentine’s Day donuts and cheap munchkins won’t last forever. These deals are expected to end on February 28, so take advantage while you can and maybe grab something for the one you love, too.